I got this as a souvenir from a friend and I fell in love with Surge right after I got it out of the box. This is large and heavy multitool but then again it's not ment for light tasks. This is heavy duty tool with you could fix pretty much everything (even a marriage if you receive this from your spouse as an appology). Surge has all the basic tools plus two bit drivers, one for normal sized bits and one for small. My Surge came with additional bit kit that includes flat/phillips/trox heads. 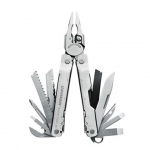 I have always thought that multitools with scissors are for women but Surges scissors are actually VERY good. They are spring loaded, sturdy and as sharp as the blades. Surge has a replacable bit for file or saw (both comes with the tool) or you can even buy a 8cm sawblade from the hardware store because you can fit a standard bosch/skil blade on the tool. So Surge isn't filled with tons of tools but the tools that are in are sturdy. The Pliers are very good but not spring loaded nor the pliers have replacable tungsten bits for wire cutting. Even the tool is big, it fits to hand nicely without feeling clumsy. If you need a really heavy duty multitool, Surge is a safe bet. Before 3 months i decided to replace my Victorinox SwissChamp with this - a very good decision! The tool is great - heavy, sturdy but comfortable. I sow complaints in forums about mass of Surge and that this tool is not suitable for belt carry. Sheer nonsense - the case is extremely good and comfortable and on waist I not feel the weight of the tool at all. My only remark is that the plain knife can not be opened quickly (by flip) with one hand. Serrated blade - yes but not the plain! i picked up this multi tool for a heck of a deal on ebay. since then, i have had it on my belt every day! it is a little heavy, but it makes up for it with the amount of tools on it. i put it to use almost every day at work pulling industrial staples out of boxes or cutting zip ties. the only down side i can think of is that the scissors on mine are a little sticky, but its nothing major.